We gave out this “recipe” last year, and it really warrants a return!Slice good quality French baguette into 1/4 to 1/2 inch thick slices. Spread thin layer of good local butter (room temp makes for easier spreading). 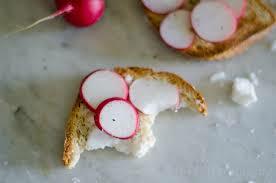 Cut French breakfast radish into thin round slices, cover buttered bread with layer of radish slices. Sprinkle Lovage salt on top to taste. Its always good to make about double what you think you would want for this appetizer as they will go quicker than you expect! You may also smear fresh goat cheese, such as Donnay Chevre, on your bread and then layer with the radishes and lovage salt. We love this recipe! The radishes are so good with butter (but really anything is good with butter). The lovage salt on top is the key, I hope we get some in this year.